Playing in his third full NHL season, the 26-year-old left wing and proud native of Ann Arbor, Michigan offered up his top ‘Favourite Athletes Of All Time’. When he wasn’t busy building on his career-high NHL goals count or netting a short-handed tally (he has three this season), Austin Watson took a few minutes to stop by NHLPA.com. Playing in his third full NHL season, the 26-year-old left wing and proud Ann Arbor, Michigan native offered up his top favourite athletes of all time. Who made Watson’s list? You’ll find two hockey players, one golfer, one quarterback, one basketball player – and plenty of Detroit content. 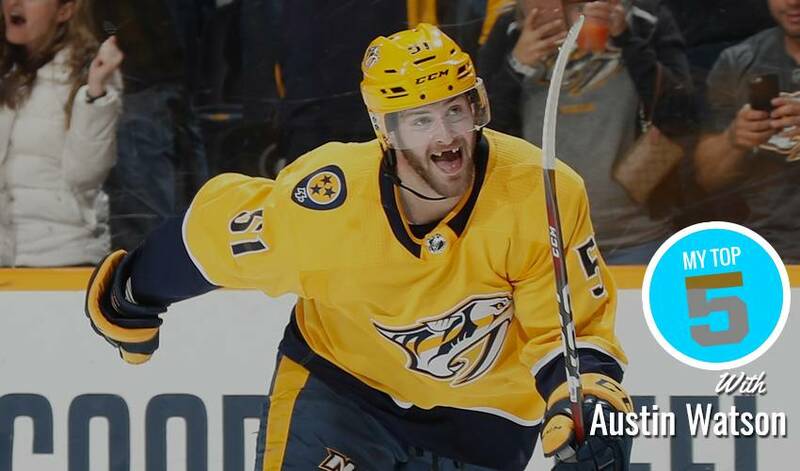 Austin Watson has been placed in Stage Two of the Substance Abuse and Behavioral Health Program (SABH) of the NHL and NHLPA for treatment related exclusively to his ongoing issues with alcohol abuse. The NHLPA and NHL announced today that Nashville Predators’ forward Austin Watson’s 27-game suspension has been reduced to a suspension covering the first 18 games of the 2018-19 regular season.